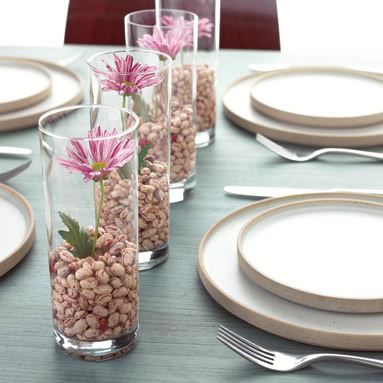 I literally swooned when I saw Everyday by Rachel Ray run this amazing piece on flowery centerpieces. As the middle-class American family guru, Rachel has associated her name with an incredible group of creative people to provide this gorgeous line of centerpiece inspiration that won’t break the bank. Incorporate your regular grocery budget with your wedding decoration budget? 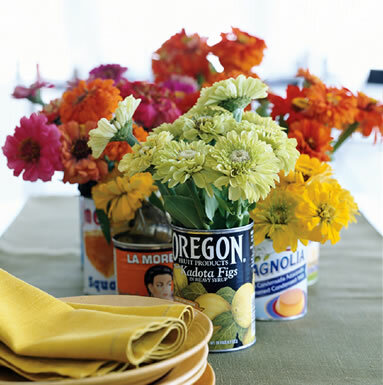 Can you say “Score!” It’s amazing how simple fruit and veggie cans put together with some basic mums can look so retro classy. Lush blooms in a creative display that make simply vases look stunning and require far fewer blooms per table… totally loving this idea! The best part about this gorgeous display is the price! 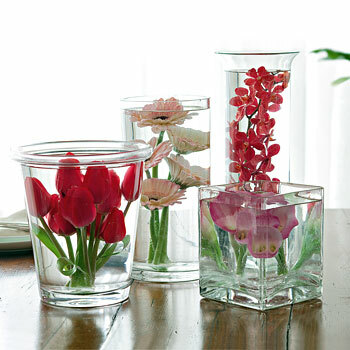 You can get away with using cheap silk flowers since the glass will distort the appearance so guests won’t know if they are real or not. At about a $1 a glass (based upon my own Ebay stemware purchases) and $.25 a votive (you can get a case of 24 for $6 at Big Lots) you can create this set for around $2 a display. Such a bargain! 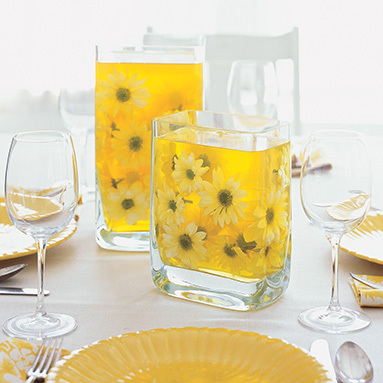 Who would have thought jello could look so cute with embedded fresh flowers? 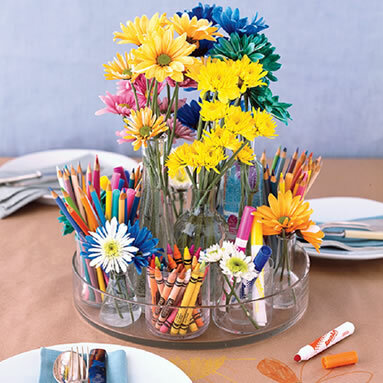 This is a very creative centerpiece for either a kids table or the wedding of an artist type couple. It seems so fun and playful and can yo imagine how much money you would save by using butcher paper as table coverings instead of cloth linens? I Love the crayon centerpiece. What a clever idea! Wow, I love all these ideas. 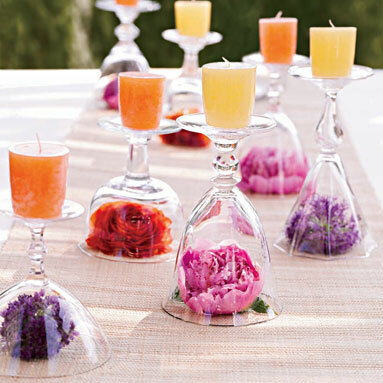 I am a big fan of candles so I really like the stemware turned upside down with the flower under and the candle on top. That jello idea is awesome. If I was going for a more contemporary style I’d be all over that.